Throughout secondary school, the literacy demands of the curriculum increase and become more knowledge-rich. Vocabulary size is a strong predictor of academic attainment, so schools are recognising the importance of conscious, planned vocabulary teaching to enrich students’ store of words. This resource summarises key research into vocabulary size and reviews the positive reciprocal relationship between word knowledge and reading comprehension. It explains what essential word knowledge is needed and demonstrates effective methods you can use to build your students' vocabulary through reading and direct instruction in all subjects. An introduction to concepts of word knowledge and the five key principles for vocabulary instruction, together with examples of activities to support direct vocabulary teaching. A top-ten collection of research reports and resources that provide contextual knowledge and insight. Academic word list (high-frequency words that are key for understanding academic writing). Pupils’ acquisition and command of vocabulary are key to their learning and progress across the whole curriculum. Teachers should therefore develop vocabulary actively, building systematically on pupils’ current knowledge. They should increase pupils’ store of words in general while making links between known and new vocabulary and discuss the shades of meaning in similar words. Pupils can then expand the vocabulary choices that are available to them when they write. 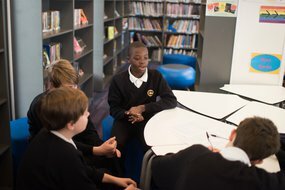 In order for pupils to improve their comprehension, it's also vital that they understand the meanings of words they meet in their reading across all subjects. Support staff to teach the vocabulary skills specific to their subject area with our downloadable presentation aimed at secondary practitioners and with a particular focus on maths.